On Monday we celebrated the first day of spring and yesterday Atlanta decided to skip straight to summer. It was sunny and hot and made us start dreaming of pool days and beach vacations. 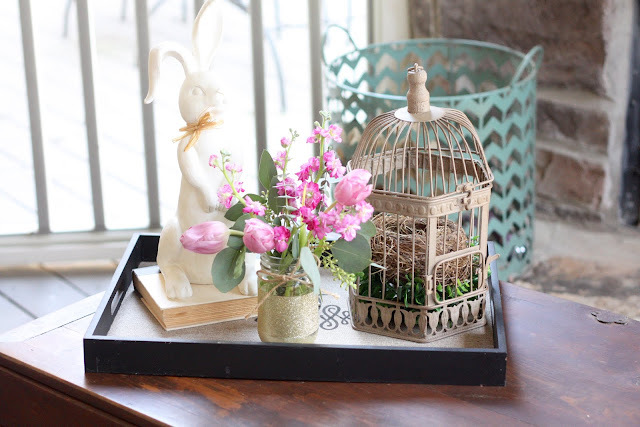 We all put on our shorts and while my kids enjoyed popsicles on the porch I pulled out all of our Easter and spring decorations. 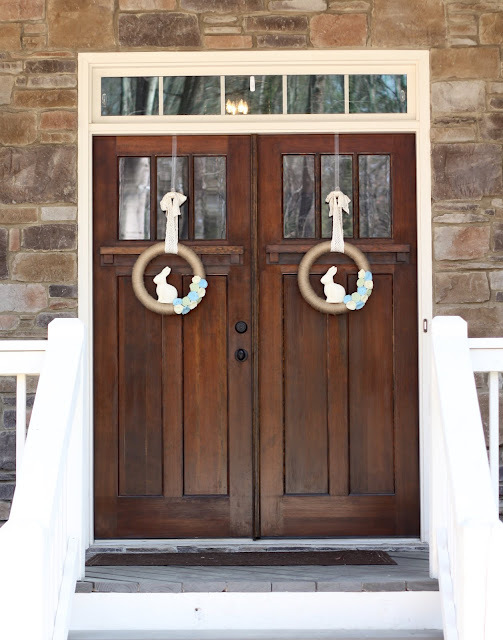 On the front porch are my DIY Easter yarn wreaths. These might be my very favorite front door wreaths that I hang throughout the year and I always get excited when it is time to hang them. 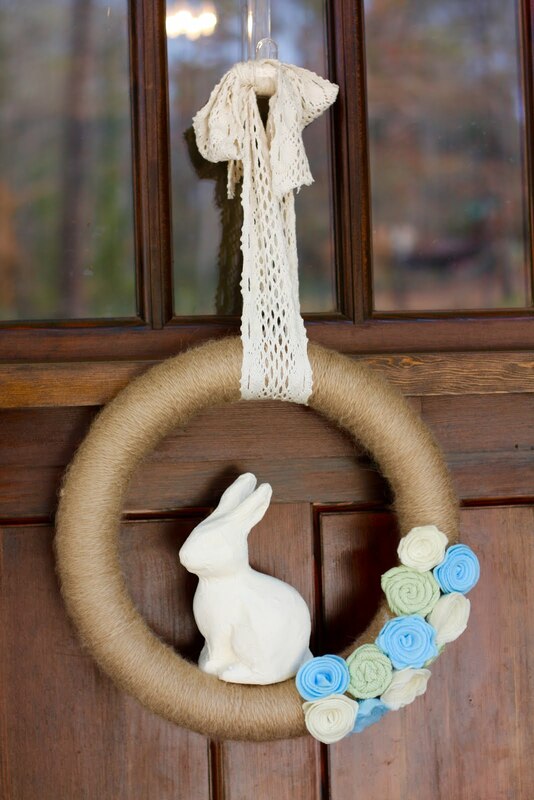 The bunny, the felt flowers, the lace ribbon and the burlap color wreath get me every.single.time. You can see the full post with the tutorial of how I made the wreaths HERE. 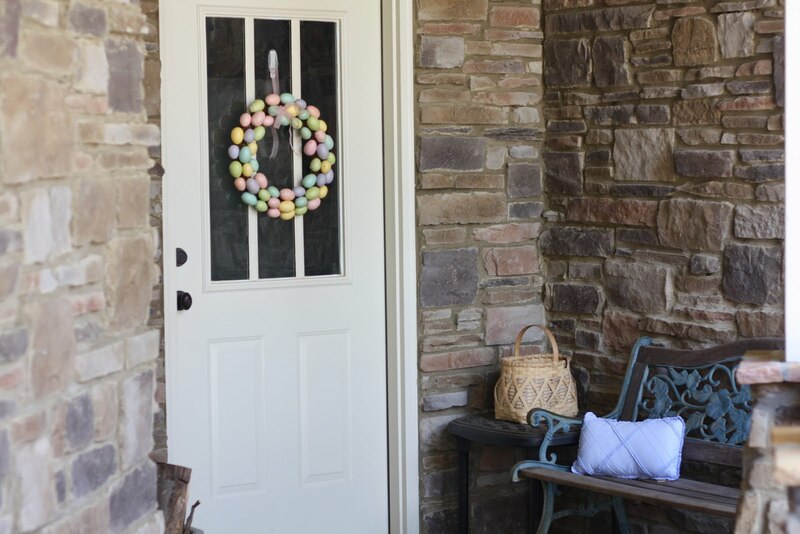 On the side door on our porch I have our Easter egg wreath that was a grocery store clearance purchase one year. 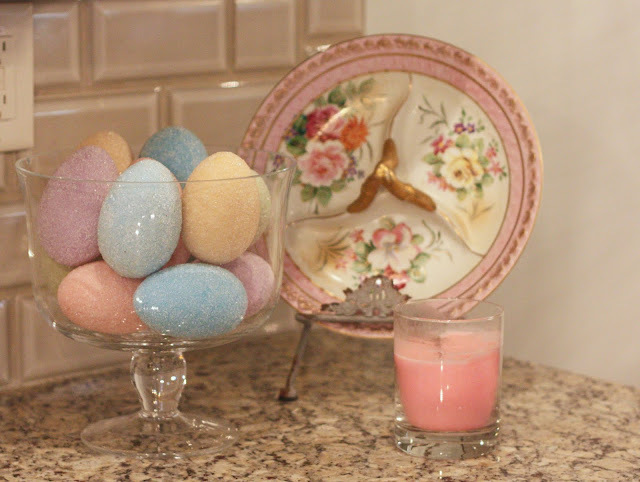 ...and these glittered Easter eggs along with an antique serving dish that belonged to my grandmother. The colors are perfect for Easter and complement each other so well! 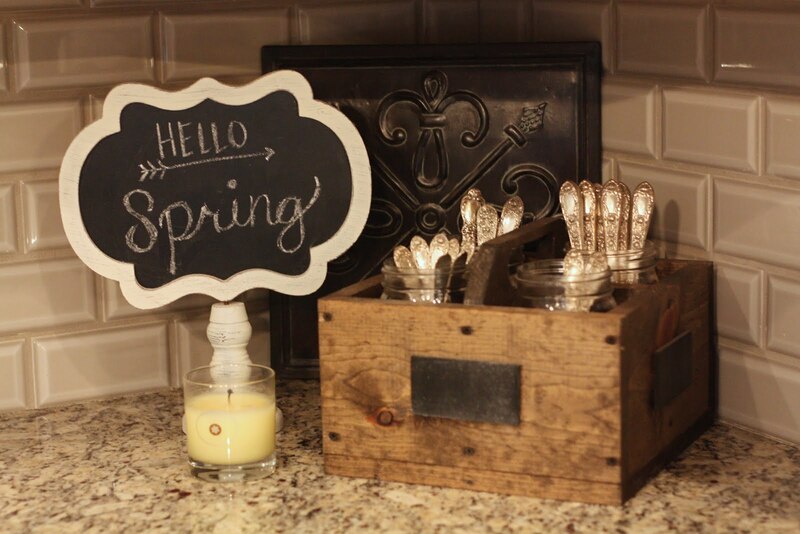 Also in the kitchen I updated my mini chalkboard sign and put out some spring scented candles. And I've really been enjoying the fresh flowers I picked up from Trader Joes last week. 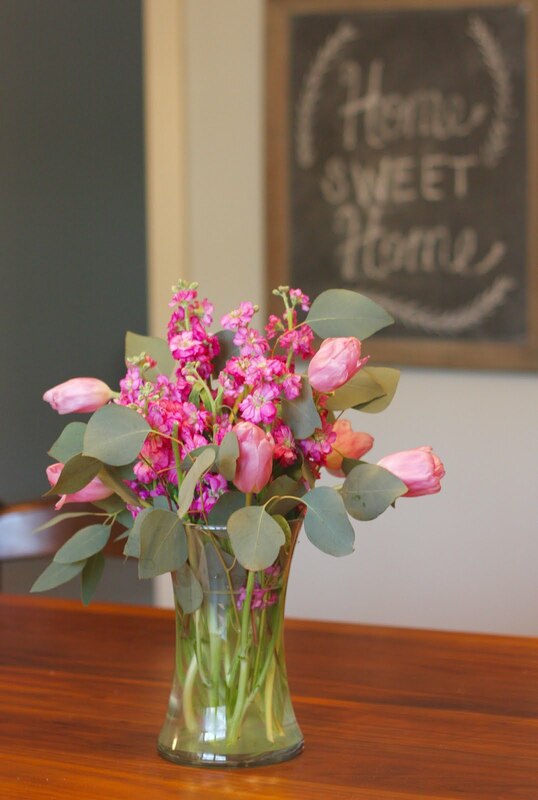 I had to cut and rearrange them once already, but they still look great and I love the color and spring feel they add to my kitchen. I also have two boxwood wreaths that I got for Christmas from my mom. I had originally planned to put them on my front doors, but that didn't work out as planned. 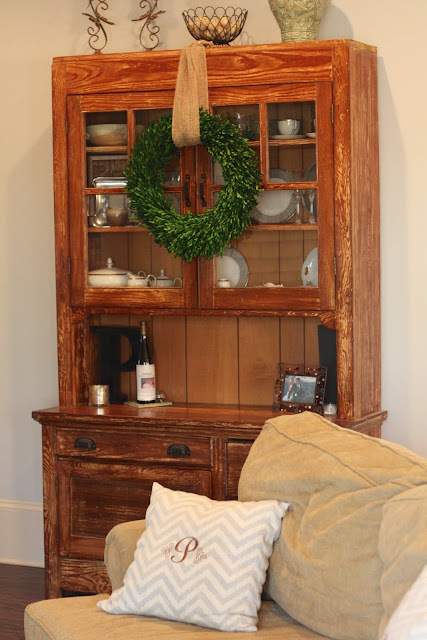 The quality of the wreaths is fantastic, but they are better for indoor use. Our porch is covered, so they weren't getting wet, but when it rained the humidity was just too much and the color was running/dripping, so I decided to use them indoors instead. 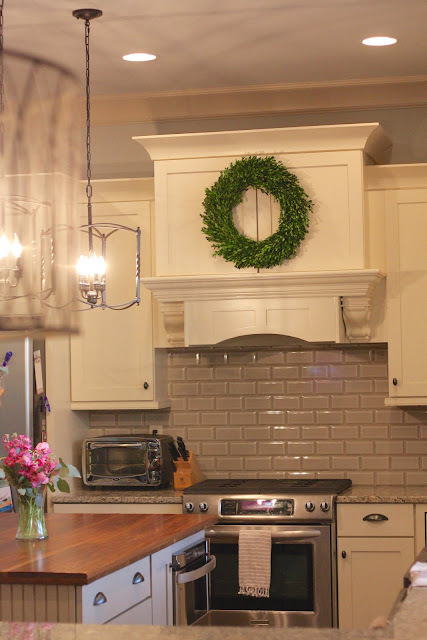 I have one over the hood vent in our kitchen and the other is hanging on the antique hutch in our keeping room. 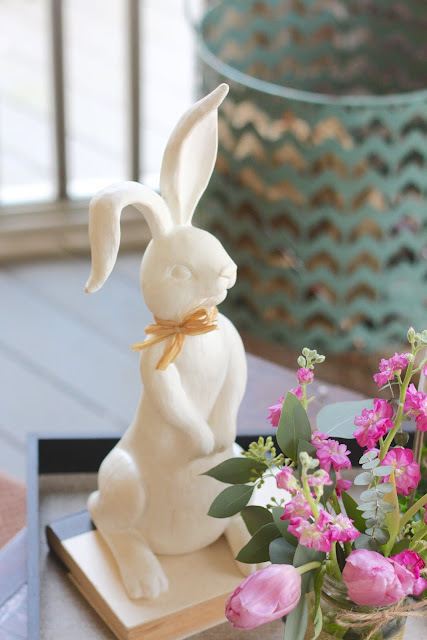 This year I was excited to add a few new pieces to my spring stash from Oriental Trading. I have been searching for a decorative bird cage, but hadn't been able to find something that was the correct size/style I wanted. I finally found this one and I loved the design. The size was just what I was looking for. When it arrived my kids were all excited because they thought it meant we were getting a bird. As a pet. Um, no. I had to explain to them it was just for decoration and we wouldn't be adding any more pets to our family...especially those with feathers. 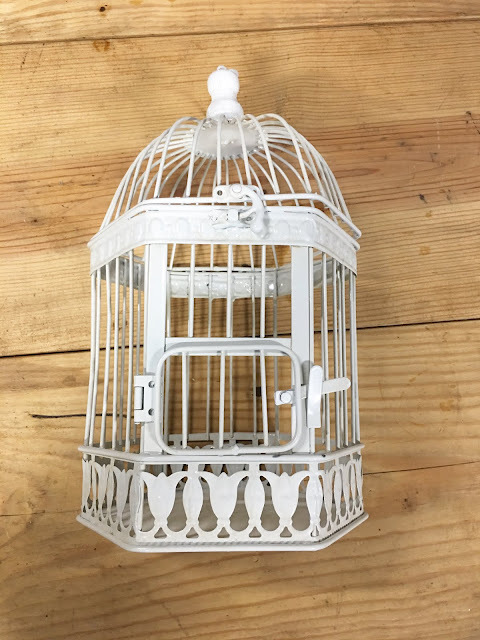 I really liked the bird cage, but decided that the white paint on it was a little too white and that I preferred a more distressed and antique look. 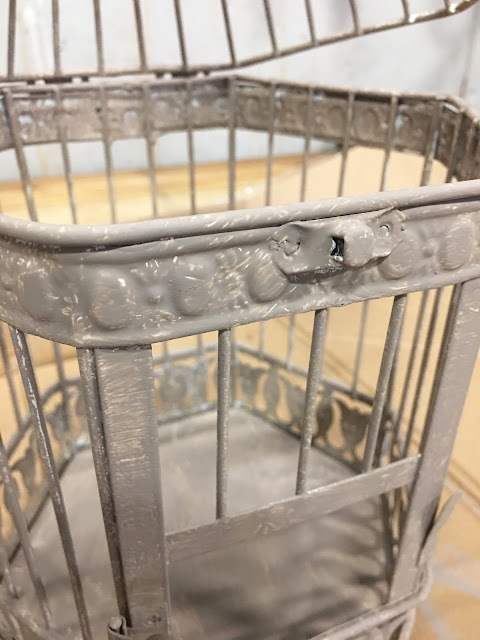 I just happened to have a small jar of chalk paint waiting for a project like this so I pulled it out and got to work. 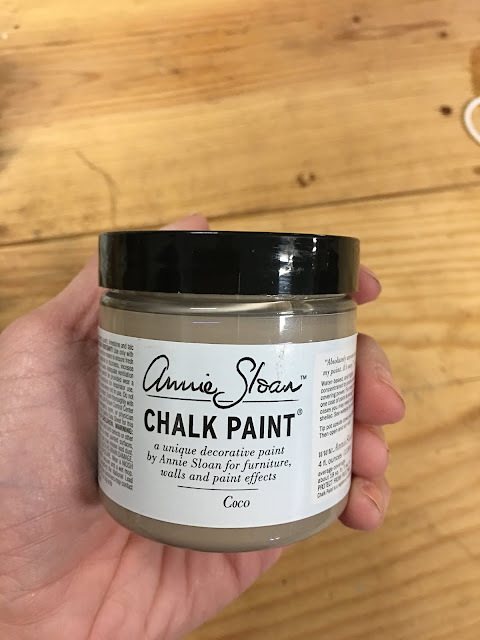 I've used chalk paint a handful of times before, but never on metal so I was curious to see what the coverage would be like. It took about 3 coats, but looked great when it was done. This picture was taken after the first coat. After all the coats of paint I put a dark wax on it and was totally in love with the final product. I put the completed project on my screen porch and think it just screams spring out there. I love it so much! 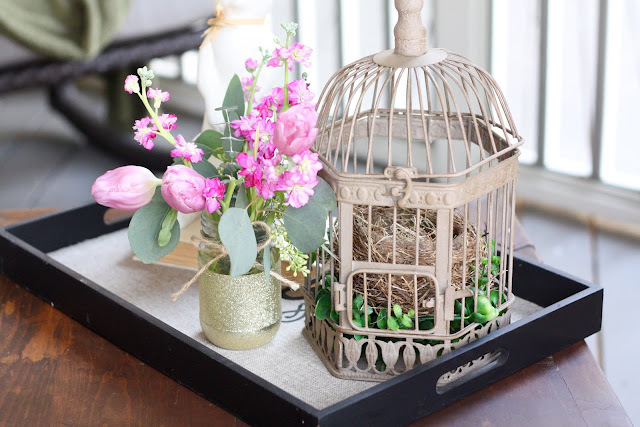 Along with the bird cage I added some pretty spring flowers in none other than a glitter mason jar. 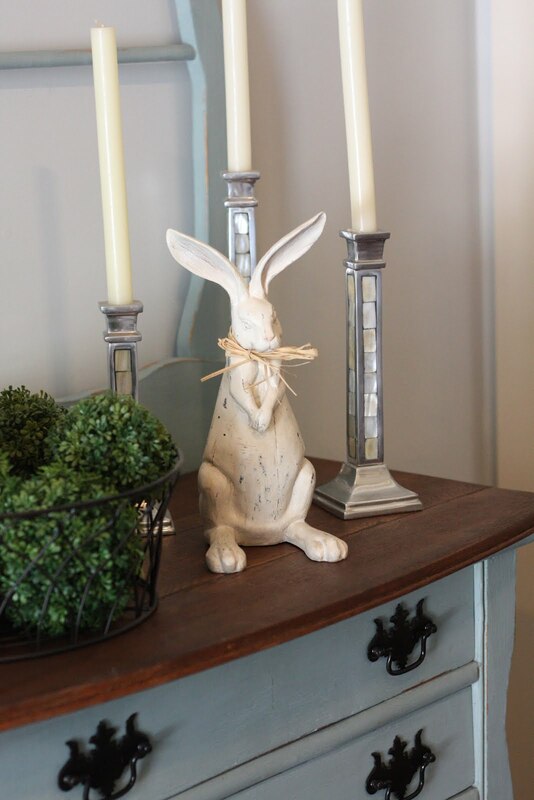 I also added this adorable little bunny (also from Oriental Trading) and thought it just complete the spring touches to my porch. 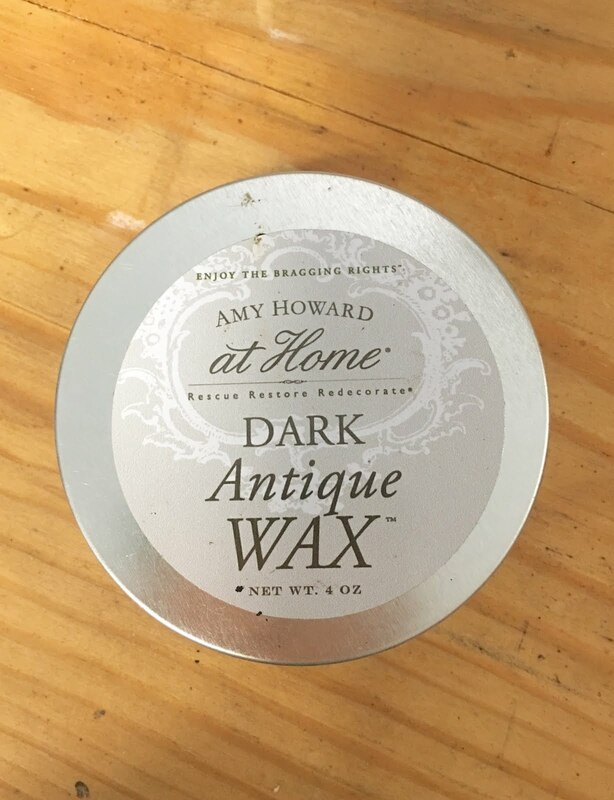 For the price it can't be beat and is made of resin so it's a great solid piece that goes so nicely with the rest of my Easter accessories. Now, if I could just keep it all clean through the crazy pollen season we are about to experience, I'd be happy!